Friday, January 20, 2006, changed my life forever. It was around 3:00 as I was dismissing my class for the weekend that I looked up and saw my big brother, David, standing in my room. I remember remarking, “Hey! That’s my big brother.” He moved across the room, and it didn’t take but just a minute to know that something was wrong. “What’s wrong?” I asked. He just looked at me and said, “Dad’s gone.” My mind would not let me comprehend the words that he had just spoken. I began to scream, “No! No! No!” I could not breathe. My brother wrapped me in his arms and we sobbed together. Christian Action characterizes a Christ-centered life and flows from a relationship with Christ. It is bearing witness to Christ and carrying on his work wherever we may be, in all we say and do. “By this all men will know that you are my disciples if you have love one for another.” John 13:35. Whereas piety is giving one’s heart and study is giving one’s mind, Christian Action is giving God one's hands and feet. John 14:6 “I am the way (piety), the truth (study), and the life (action). My brother knew that I would not handle the news of my dad’s death well. You see, I was my daddy’s little girl. My dad once wrote a letter to me that said, “Dearest Teresa, I have had a lot of time to reminisce while I have been working on your photo album. Some thought that you were my favorite child. I didn’t try to hide the fact that you were / are my favorite. You have been my encourager for many years. Your monthly cards, plus e-mails are so very encouraging to me.” And so, my brother, my dear sweet brother, caught a ride from work from a Christian friend so that he could come, in person, to my classroom and hold me while I wept. Next, David went with me to my house to tell my husband, and from there we took him to tell his wife. The next several hours and days were spent notifying family and friends of my dad’s sudden passing from a massive coronary and making plans to travel to Littleton, Colorado, for the funeral. The love that we were shown was amazing. Sunday morning our worship leader led “How Great Thou Art”, a family favorite. You know, we hardly ever sing that song. We would sing it again at Dad’s funeral. Following church services, some friends offered to let me use their frequent flyer tickets to fly to Denver, and an elder and his wife wrote me a check for $200. Monday morning I flew to Denver. My husband and son would drive up later and join me. My mom’s friend from her church, Mary, had offered for my sister, Lynne, and I to stay at her house since my other sister’s family was staying with Mom and my brother and his family would be staying at my dad’s. Mary also loaned Lynne and I a car to drive until our families were able to join us. My nephew, Ryan, booked our families rooms for the weekend at his hotel. On Tuesday, we met the pastor and his assistant, Wendy, at Dad’s church. The church was fabulous! They offered to make a power point for Dad’s service and assist us in any way that they could. Flowers began arriving. When I looked at two of the cards, they were from my ladies’ bible class bunko group and our Sunday morning bible class. I felt so loved. The funeral home had set up an online guest book for people to sign. The website….www.legacy.com. There were more friends from Lubbock who signed than anywhere else. Saturday, the day of the funeral, was a beautiful but cold winter day. There was snow piled up on the sides of the road. The procession from Dad’s church to the cemetery was several miles. His church family wanted to have a reception for the family following the burial; however, they weren’t sure how many people would make the drive back across town to attend. My parents had purchased the burial plots in the cemetery together in 1978;however, in 1985 my mom and dad divorced and my dad had kept the plots. Interestingly enough, the cemetery is right behind the church where my mom presently attends and my parents had attended together when they were married. So…my mom asked the ladies at her church if it would be okay to have the reception in their fellowship hall following graveside services. What took place was a combined meal by Dad’s church and Mom’s church for our family. Two different bodies of Christ, two different denominations, coming together to show the love of Christ. Sunday my family drove back to Lubbock and Monday morning I returned to my job. I was greeted with flowers from my students and coworkers along with cards and hugs. Later the same day, one of our PTA moms came in my room with a single yellow rose (My dad use to call my mom his yellow rose of Texas) and a card that contained a gift card to the Olive Garden. (My dad’s favorite restaurant) Wow! More Christian love. A few days later one of my students, Kylar, sent me a link to a website that I had shared with my dad in November 2005. It is a power point to “I Can Only Imagine.” When I sent this to my dad he had responded, Awesome, thanks!!! In fact, when my brother checked my dad’s computer he had found this in Dad's Drafts folder, ready to send to me. And now, one of my sweet girls was comforting me with the same powerpoint. A few days later I received the following prayer in an email from an Emmaus friend. I remember when you wept at Lazarus' tomb, when you met the funeral procession and raised the widow's son from the dead. Lord you do all things well. I bring my sweet friend Teresa to you. Her heart is breaking. O Lord you are the God who heals. Heal this breaking heart. Ease the deep pain. Thank you that you are with her in this shadow of the valley of death. TAKE HER THROUGH IT IN JESUS NAME. I know you will. I ask this in Jesus name. Amen. There was so much love, so much Christian Action shown to my family those first few days following my dad’s death. What is Christian Action? Christian Action is a natural response to God’s grace. God’s grace awakens us to the greatest reality of our lives---God’s redeeming love and our spiritual kinship. Having received such a gift, we are naturally enthused and empowered to share it with others. Each person’s response to grace in Christian Action will be unique according to his or her gift and talents. Each person that ministered to me following my dad’s death, had a unique gift that they used to comfort me in my time of loss. One of the many people that I called to tell about my dad was my Reunion Group. They had been praying for me from the minute they received the news. Then, when I attended our meeting the week I returned home, they told me that they had not sent flowers because they had collected money and were going to give a scholarship in Dad’s memory to help someone attend a Walk To Emmaus. My heart was so touched. Tears began streaming down my cheeks. You see, what no one knew was that the last time I had been in Colorado, August 2005, my dad and I talked about the walk to Emmaus and I told him that my brother and I wanted to sponsor him. We looked up the web site, and I showed him where he could read about it. He told me he didn’t think he could go if he didn’t have a schedule to follow, but I assured him that he would do just fine. Instead, he is on his eternal Walk and because of the love of my reunion group, someone else’s life had been blessed. Of course, when the song was over I had tears streaming down my face. My son had shared the words that I needed to hear at just the time I needed to hear them. Months passed, and summer came. My brother and his family drove to Colorado to get some of the things that my dad’s wife wanted us to have. When he returned I went to his house and we went through memorabilia. One of the things that we came across was boxes of pieces of stain glass. Dad was always in the middle of a project, but I didn’t know anything about the stain glass. I later learned that he had taken stain glass classes so that he could repair the glass on an antique organ that he had purchased. My brother and I talked about what we wanted to do with the glass and thought an art teacher might like to have it. The following month my Reunion Group meeting was at Sandy’s craft shop. We were in the middle of talking and she told us about a friend of hers who had passed away from cancer and her friend’s family had given her some stain glass tools. You can imagine my surprise! I looked at her and asked, “ Would you like to have my dad’s stain glass?” She was honored. The second time they got together to finish the necklaces I was out of town. But the following week we met. Sandy called to make sure that I was going to be there because she had something for me. My husband was even in on the surprise. 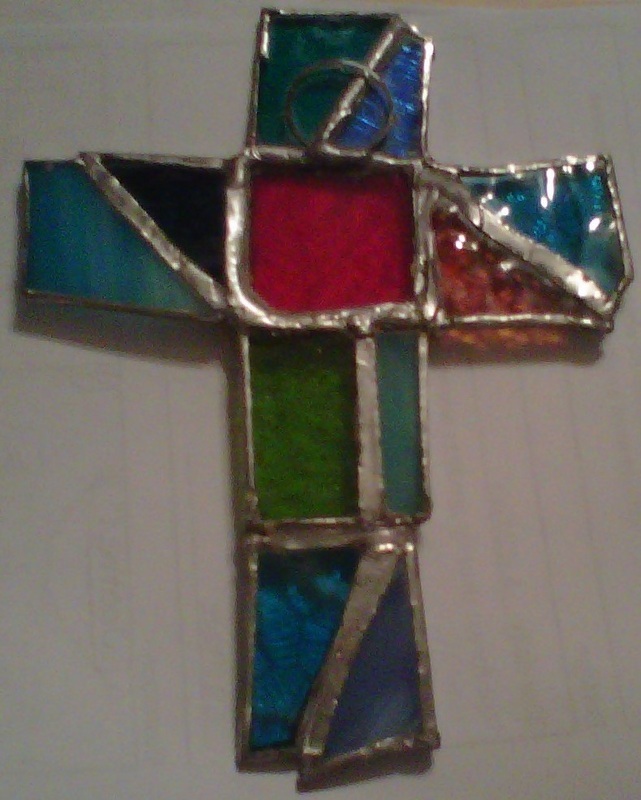 You see, my Reunion group took the left over pieces of glass that they used to make our necklaces, and made this cross. A gift of love. What is your gift of love? When I was a little girl my mom would sometimes sing our morning prayer, It went like this “Help us to do the things we should, to be to others kind and good. In all we do in work or play. To grow more loving every day." Isn’t that our gift of love? To help others, to be kind and good, and to grow more loving every day? Consider what qualities and gifts God has given you to share Christ and his grace. Reach out to those who need a helping hand, to people you may not even know. Meet felt needs, and seek to change circumstances that cause those needs. Listen to those to whom Jesus listens. Remember, the trials we go through in our lives help us to help someone else who is going through a similar trial. Reach out with Christ and grow in selfless love as a servant. Live in unity with Jesus Christ. Care enough to make a difference. Our mission is to pass on the gift that we have been given. At such 'n' such ... it wouldn't matter much.